Something’s happening at 3331 Arts Chiyoda. The floor is carpeted with artificial turf, the gallery assistants are sporting bright orange jumpsuits and the walls are painted a cloudless blue. Mobiles and model aircraft are suspended from the ceiling whilst the sound of horns playing a cheery tune can be heard from the speakers of a wall-mounted monitor. A couple of flight simulators equip one corner of the main gallery, installed among gliders and aeroplanes designed for a single pilot. This is the story of the daredevil antics of aviation obsessive Kazuhiko Hachiya. Welcome to “OpenSky 3.0”. A decade in the making, “OpenSky 3.0” is a culmination of research and development, of prototypes and test flights that chart Hachiya’s design permutations to realise a personal flying machine. The full title of the exhibition is “OpenSky 3.0 – Creating the Aircraft of Dreams”. Although 3.0 refers to the current aircraft, the exhibition as a whole documents the journey Hachiya has made to reach this point. Initially working with gliders, he has used wood and fibre-reinforced plastic to create ultra-thin, light-weight aircraft. The overall shape and wingspan hasn’t altered dramatically during this period. Until recently, his flying vessels have been towed by a cord–such as the glider Open-Sky 2.0 (2006)–but his most recent version, 3.0 (2013), sees the project reach its apex with the inclusion of a jet engine that permits the possibility of sustained, solo flight. Hachiya’s (almost) hobbyist approach can be found in his use of balsa wood, a material more commonly associated with model making than that of a completed aircraft, and goes some way to reveal how the work came about. Generally speaking, “OpenSky 3.0” is far closer in ethos to D.I.Y. than it is a product from the aeronautics industry. Seen from this more personal perspective, Hachiya’s aspirations evoke a more innocent age of marvel. Before flight was militarized, before commercial charters became commonplace and well before the exploration of the skies was irrevocably tainted by acts of terrorism, the invention of flight launched an industry of craftsmen and workshops, with pockets of inventors near airstrips testing their incredible contraptions. If this is beginning to sound like a cosy image from a Hayao Miyazaki movie, then we’re getting closer to the origins of Hachiya’s design. 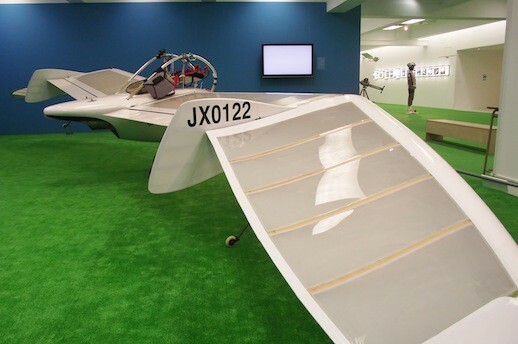 Based on Möwe, a gull-like glider from Studio Ghibli’s 1984 anime Nausicaä of the Valley of the Wind, Hachiya’s aim has been to adapt a fantastical aircraft from the frames of a film to the skies of Hokkaido, Kanagawa and Chiba. The movie itself is full of windmills and airships, giant warrior folklore and insect spores—a fantasy adventure where the heroine unites adversaries and saves an ailing world from the perils of its own making, much of which is accomplished by her skilful swooping on Möwe. Hachiya’s designs retain Möwe’s overall appearance, with a small bodied fuselage, handle rails that run the length of the body and two arched wings. It’s just that OpenSky 3.0 propels itself too. Of course Hachiya isn’t the first artist to be captivated by the prospect of flight. 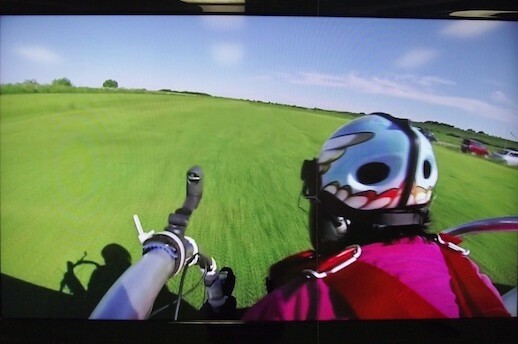 Recent instances would include artist Yukinori Yanagi, who created Ornithopter (2005), an installation of a projector, a computer program and the flight harness of a hang glider that simulated the experience of flying. As recently as 2011, photographer Natsumi Hayashi’s series ‘Today’s Levitation’ rejected the world’s gravitational pull with a playful series of illusionistic prints. Both these examples concern themselves with tendencies more familiarly seen in art galleries; the appearance or illusion of their subject. In 3331 Arts Chiyoda, this isn’t the case. Ordinarily, whether a work succeeds is assessed by the artist on aesthetic, narrative or conceptual grounds. With Hachiya’s “OpenSky 3.0”, he must have been fairly confident it would actually work before he took his flight of fiction. During this year in Noda, Chiba Prefecture, it did. Perhaps hover boards will be next?